Miles from the Splash Brothers’ court at the Oracle Arena – from the sudden and real worry surrounding the Golden State Warriors – a renowned Bay Area rapper is heckling a youngster who had the temerity to throw up a sorry shot in the middle of the afternoon on the east side of The Town. The three of us are at “The ‘Wood” – Mosswood Park in Oakland, California, where a schoolboy legend barely standing 5-foot-10 once won a dunk contest by jumping over a drop-top Chevrolet, spinning 360 degrees in midair and throwing it down with malice. And then threw away his life. 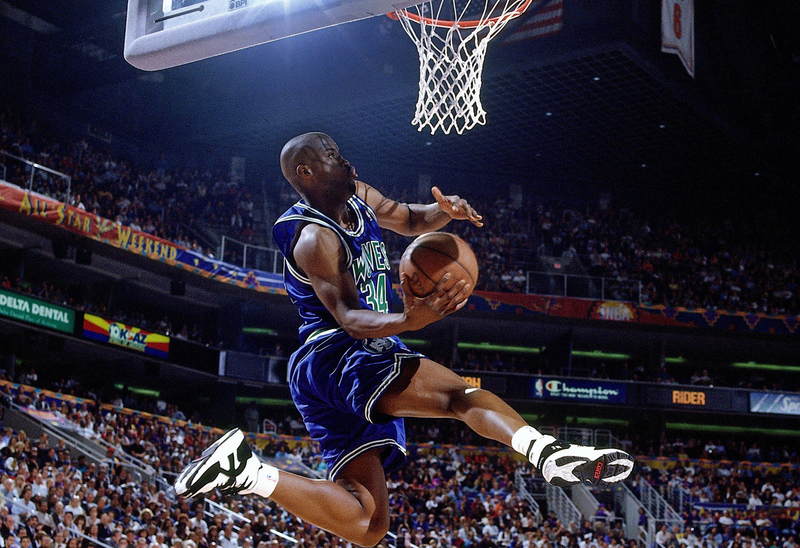 Isaiah Rider #34 of Minnesota Timberwolves attempts a dunk during the 1995 Slam Dunk Contest. We know what you’re sayin’. The Town is growing impatient this week. It’s waiting. Not like Northeast Ohio has been waiting, of course, no 52-year, Cleveland/Believeland purgatory or anything. Still, when your crew eclipses Michael Jordan’s Chicago Bulls for the greatest single-season record in NBA history, when your baby-faced assassin becomes the first player since Larry Bird in 1981 to lead a team back from a 3-1 deficit in a conference final, you want that gold-gleaming ball atop the trophy back in Oakland. You want the cherry on the top of the sundae. You want to be dancin’, huggin’ and mean-muggin’ after the confetti falls from the rafters onto the heads and shoulders of your champions for the second straight season. Shoot, the parade route has been set for two weeks now. 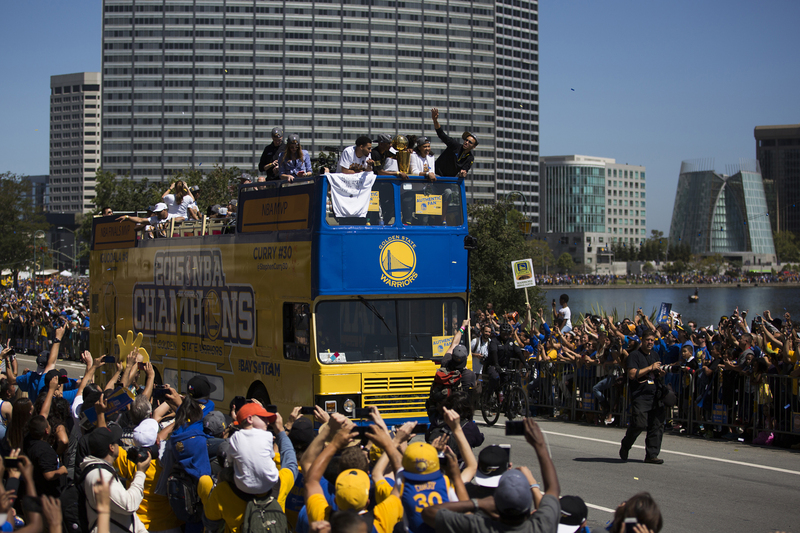 Just like last year, Warriors Stephen Curry, Klay Thompson and friends are supposed to board a float at Broadway and 11th Street downtown, turn right on Grand Avenue and make another right on Harrison to Lakeside Drive before ending on Oak Street. The Warriors rep the entire Bay Area, but on a visceral, emotional level very much belong to Oakland. From Mosswood in the east to DeFremery Park in the west, where basketball greats Bill Russell, K.C. Jones and Paul Silas plied their trade 60 years ago, from the ground floor of playground hero-worship to Oracle Arena and the Dubs, Oakland ‘ball is an essential part of the city’s identity. And for all the sentimentality around Cleveland being 48 minutes from its first major-sports title since the Browns in 1964, know that The Town and its team only have so much time together. 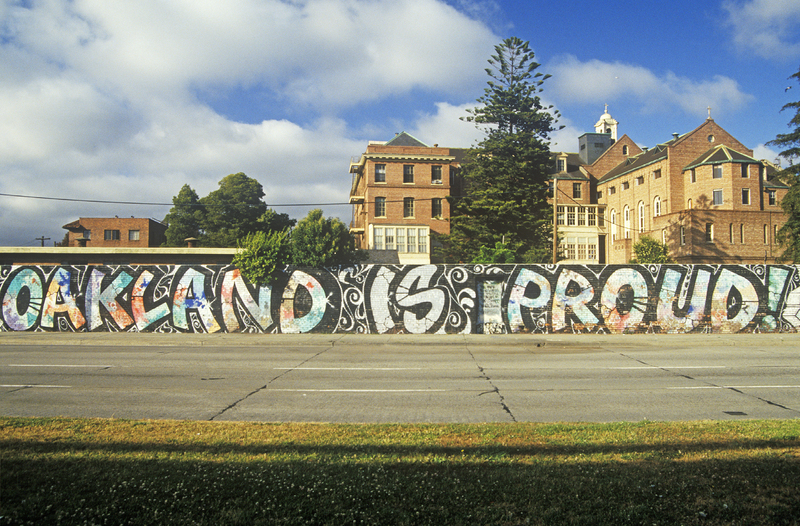 Belying this authentic communing between the people of Oakland and the Warriors is a hard truth: The Dubs are deep into plans to leave Oakland, their home of five decades. A newly designed, soon-to-be-built technodrome across the bay in San Francisco promises more seats, much more revenue and many more amenities than a renovated 50-year-old house of howls like the Oracle (née Oakland-Alameda County Coliseum). Projected move date: 2019. I made the mistake of reminding Ice Box (aka Robert Smith). “I don’t know what I’m going to do,” said the arena security guard of 28 years in a low voice, shaking his head in resignation. Ice Box protects the Warriors and their fans. He is a barrel of a man, going about 5-foot-10 and an easy 270, he says. He is a little-known institution here. East Oakland to the core, he started a roller derby career at 16 with the Bay Area Bombers. He watched Dwayne “The Rock” Johnson’s father, Rocky, wrestle at the Cow Palace. His core indeed has the circumference of an icebox. He is still an active tag-team wrestler at 52. Yet his enduring sports memories are from patrolling the corridors, tunnels and locker rooms of the Warriors’ home since 1966 – getting to know Run TMC (Tim Hardaway, Mitch Richmond and Chris Mullin) in the early 1990s; seeing Baron Davis and Monta Ellis light it up, circa 2007; and now being awestruck by the Splash Brothers, Curry and Thompson, who seem to launch from the Bay Bridge and beyond. “It’s a disheartening feeling to know they’ll eventually be gone,” said Moses. Stephen Curry #30 of the Golden State Warriors waves toward the crowd along Lake Merritt from a double decker bus during the Golden State Warriors Victory Parade in Oakland, California. For Fab, Sam and Ice Box, removing the Warriors from Oakland will be like taking the top off an ancient pyramid. Inside, you’ll find yellowed newspaper clippings and grainy black-and-white footage. The place is full of fantastical tales from the parks that sculpted future Hall-of-Famers and made high-school gymnasiums such as those at McClymonds, Skyline, Castlemont and Oakland Tech reverberate with choruses of “Oooohhhhhh.” Summer pickup players became artists and acrobats, their free-flowing games a form of jazzy syncopation. Ultimately, Oakland basketball produced the most tenacious, tested, true-grit ballers west of Harlem. Oh, and never forget a phenom simply called Hook – Demetrius Mitchell, the most explosive, gifted athlete all of them can remember, the kid who won that dunk contest and so many others by levitating over inanimate objects such as bicycles and cars. Apart from a tryout with the Warriors and an itinerant college career, Hook never made it. But he’s revered to this day. Even Fab, who, before he started crafting his own hooks and rhymes for Too $hort and slaying a five-minute freestyle on the Warriors (more on that later), once balled at Hardaway’s invite-only camp as a young teen. Shaw told me he keeps one book with him at all times, Home Field Advantage: The City That Changed the Face of Sports, written by Paul Brekke-Meisner. Demetrius “Hook” Mitchell jumps over a car during a Volkswagen event during NBA All Star Weekend February 19, 2005 in Denver, Colorado. No one had seen Hook in a while, including Glen Graham, who runs a basketball camp where Mitchell used to be a counselor and who was one of the first to personally train NBA players. Graham said that when a young player shows remarkable talent and desire, a larger community looks out for and protects that player. And Mitchell? “He got caught up too young.” He stayed with the Moses family during his one year at Hayward State University. Athletic and strong, able to leap and touch the top of the Mosswood backboard when he was just 5-foot-8, he became the first player to represent Oakland at fabled Rucker Park. Crack cocaine and a string of arrests ended it all. He got sober for a while and many people helped him out. But the general feeling now is: Don’t help Hook until he helps himself. We all ran out to witness a 15-year-old from St. Joseph’s High in nearby Alameda bring his team almost all the way back from 20 points down, intercepting passes at half court, taking off from the dotted line and dunking on two seniors that went 6-6 and 6-7. It was Kidd’s coming-out party, the night he first made a big building rumble. Moses turns left, looking for the first house he owned – a single-family residence with no more than 1,000 square feet on Weld Street, which now features men in cars waiting to be flagged over. I look at a couple of young boys on the porch who need to be in the Bubble, and I remember something Fab told me over the phone the day before. “Support system goes a long way. Not just talkin’ about athletes. With no support system, it’s hard to realize your worth because no one took consideration to invest in you emotionally. You feel like you’re left alone in the world. You feel like no one loves you. And it’s hard to carry on when no one loves you. Now it’s on to Touch Of Soul, a restaurant in North Oakland owned by Fab’s cousin. The ribs are smothered in a sweet, tangy sauce and on a separate plate come baked beans, collard greens and a potato salad with just the right amount of vinegar and mayo. Fab might be the Warriors’ most animated fan, chirping at LeBron James from his A-1, Section 1 seat at the Coliseum for the entire series. Curry and Thompson, Fab and Sam admit, aren’t your hard-core, Oakland street-ballers. The more championships the Warriors win, of course, the more their departure from The Town is going to hurt. They call this progress, but there is something that doesn’t feel right about it. There was a reason that this team belonged in Oakland. It’s more than the legends and the playgrounds they came from. “They say we down 3-1 so it’s ovah. “Hold up, World B. Free, Nate Thurmond and some other OGs. Who you think Wilt played for when he scored the hundred?